Cony, Lawrence and Maranacook/Winthrop welcome new faces with the 2019 season set to begin. 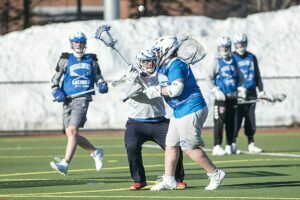 FAIRFIELD — Dan Brannigan has a leg up on the competition, even before the new high school lacrosse season gets underway. One of three new boys varsity coaches in the area, Brannigan got a bit of a dress rehearsal last season at Lawrence. The former Oak Hill head coach inherited the team from Bill McKenzie midway through last spring and coached the building Bulldogs to three consecutive wins to close out the campaign after an 0-9 start. Brannigan joins Kyle Dennett at Maranacook/Winthrop and Jacob Whitaker at Cony as new faces in charge of lacrosse programs this spring. While Dennett and Whitaker inherit established programs, Brannigan has a Lawrence squad that’s still — several years after its inception — in an infancy stage. The Bulldogs have never qualified for the playoffs. Brannigan started as a volunteer assistant coach last season at McKenzie’s invitation. Maranacook/Winthrop’s coaching position was similarly handed off to Dennett. Dennett spent the last two seasons as an assistant coach to Zach Stewart, who was the Hawks’ coach for six seasons. 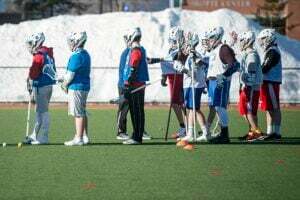 He was the assistant coach at Kents Hill for two years before that, and in the meantime he’s been heavily involved with the Kennebec Cannons youth lacrosse program — where he coached several of his current players at the youth and middle school levels. Where Stewart was an offensively-minded coach, Dennett said he prefers emphasizing defensive play. He’s hoping that the recent form Maranacook/Winthrop found itself in, with deep playoff runs, can continue. After nine seasons at Cony, Chad Foye moved on to an administrative position at Messalonskee. That opened the door for Whitaker, who was Foye’s assistant coach last spring and an assistant coach with the school’s varsity hockey team for two years, too. Whitaker said it struck him early in the preseason that things had changed. The Rams will try and be a more play-oriented team instead of a freewheeling one content to utilize the creativity of its most talented attacking players. Whitaker has emphasized teamwork during a preseason that — thanks to Thursday’s scheduled season opener at Brunswick being postponed by poor field conditions — will extend until April 27. Even through their programs are all at different stages, Brannigan, Dennett and Whitaker are all in the business of building. Brannigan knows that role all too well, having been at Oak Hill from 2011-2015 before a career change forced him to step down with the Raiders. While Lawrence is slightly more established than Oak Hill was eight years ago, there is still work to be done to get the Bulldogs into the title mix in Class B.